Velafrica connects work and integration in Switzerland with development in Africa. Since 1993 the Non-Profit Organisation has collected old, worn-out bicycles, refurbishing them with social institutions and exporting them to its partners in Africa. there are 479 permanent and free collection points for bicycles across the country. Every year, an additional 50 collection events are organized. thanks to functional recycling of our bikes, 350 tonnes of old metal is saved from the shredder each year. 360 unemployed and physically challenged people refurbish the donated bicycles and prepare them for transport to Africa. in 2015, Velafrica sent 38 shipping containers with 17‘455 donated and reworked bicycles from Switzerland to Africa. since 1993 over 140‘000 donated Swiss bikes have found a new owner. On average, four people benefit from the use of a bicycle. by 2015, 106 youth completed an apprenticeship in bicycle mechanics. 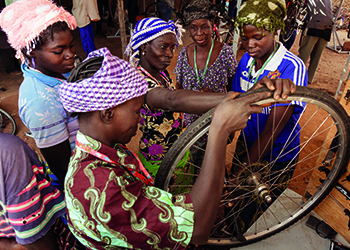 Bicycle workshops create jobs in repair and sales. Velafrica has the support of 30 partners across Switzerland. Between Liestal and Brig, Bulle and Chur, a dense network of social enterprises work towards integrational work. in 2015, Velafrica started an export workshop in Liebefeld, Berne as an integrational project for refugees and migrants. They work with 13 regional partners in Gambia, Ivory Coast, Ghana, Burkina Faso, Tanzania, Madagascar, and Eritrea. This partnership is done with non-profit and selected small businesses. We foster a relationship based on economic collaboration to promote social entrepreneurship. The bicycle is an affordable alternative that spares people from walking. In cellars across Switzerland there are many bicycles that remain unused. 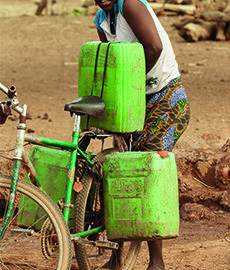 In the developing regions of Africa however, cheap forms of transport are scarce. The recycled bicycles from Switzerland improve local access to education, health care and economic opportunities. 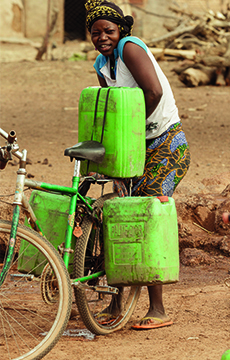 After research done by Velafrica in Burkina Faso and Tanzania, mobility was found to be the most important factor in overcoming poverty. I am so happy that I walked into Angela during the ECO festival in Basel and it makes me even happier to share this awesome project with all of you.